In order for your care to be matched to an appointment with an expert in the field of your diagnosis, it is necessary to have your records available to our physician reviewers prior to scheduling an appointment. Therefore, we ask that you have your referral and medical records faxed to 410-550-6255. It is important to include the following: a referral from your current physician, demographics, insurance card, any clinical notes, imaging reports (including x-rays and MRIs), lab results, other tests results as applicable (such as pulmonary function tests echocardiograms, pathology reports, EMG/NCS results). A new patient evaluations typically involves consultation with one or more physicians and completion of various tests. All of these need to be scheduled in advance of your visit. Dr. Baer reviews the records of each new patient in order to plan the most appropriate evaluation. It is particularly helpful if you write brief note to indicate what issues would be addressed during your visit. This ensures that the proper evaluation can be pre-arranged. Once the review process has been completed, you will be contacted by one of our intake coordinators to assist with scheduling your appointment. You may also call the scheduling office at 410-550-1887, option 2 at any time to inquire as to the status of your record review. For International patients, please contact Johns Hopkins International for initial and return patient appointments. Unfortunately, our physicians cannot speak with or give medical advice to patients that are not currently under our care. The original pathology slides and report from a labial gland biopsy. It is particularly important that we have the actual labial gland biopsy slides as this may be crucial for making the correct diagnosis. 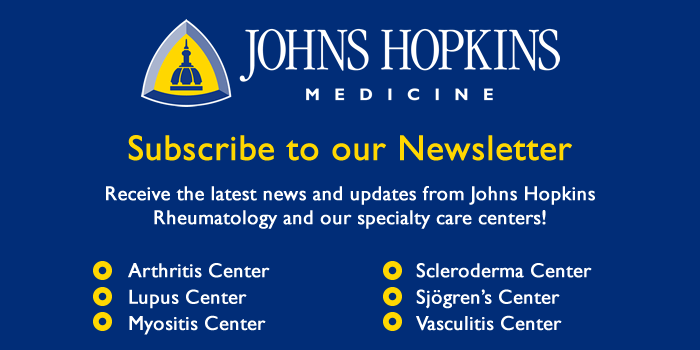 To make your appointments at the Sjögren’s Syndrome Center, please call 410-550-1887. On the day of your appointment, plan to arrive 30 minutes ahead of time for registration and vital signs. Remember to bring a copy of your insurance card(s) and completed Patient History Form to the appointment. New patient evaluations in our Center typically involve appointments with multiple physicians and may take two days to complete. Our medical office coordinator will be happy to make recommendations for local hotels and transportation companies that offer discounts to our patients. Please see our Accommodations List for additional information. You will need to plan for a one day visit to the Center as a return patient. Return appointments for the Jerome L. Greene Sjögren’s Syndrome Center can be made by calling 410-550-1887, option 2. You may also be asked to complete some additional forms to allow us to bill your insurance, to review your health, and let us know how you have been doing since your last visit. Late: The appointment time scheduled for you is time specifically allotted for your visit. If you are running late for an appointment, please call our scheduling office. Please note if you are more than 15 minutes late for your scheduled appointment time, we may not be able to accommodate your visit. Canceled / No Show: If you are unable to keep your appointment we require a minimum of 24 hours’ notice. If you repeatedly do not provide our office with 24 hours’ notice, you may be subject to be discharged from our practice. Our clinic is very busy and unfortunately patients often have to wait several months for an appointment. If you need to reschedule your appointment, please call us at 443-997-1552 as soon as possible. This will allow us to schedule another patient who is waiting to be seen. Our normal clinic hours are Monday – Friday 7:30am-5:00pm. Our normal phone hours are Monday – Friday 9:00 AM -4:00 PM. There may be other posted days that are closed due to divisional activities and/or professional development. That information will be provided on all divisional voicemails. If you are experiencing a medical emergency after-hours, please call 911 or go to your nearest urgent care facility or emergency department. If your need is a medical management question that cannot wait until our next business day, we offer an On-Call Provider to help you. Our On-Call Provider may be paged by calling our answering service at 410-955-6070. It is the policy of Johns Hopkins Medicine to reasonably maintain outpatient clinical operations; however, due to weather or other unexpected closings, such as an area-wide power outage or water main break, there may be times when it is necessary to close our office. Our closing notices will be provided for you via our voicemail recording and our staff will contact you if we are not able to keep your appointment, let you know what we are experiencing, and when we may be looking to reschedule your visit. *We do not participate with out-of-state Medicaid or Medicare Advantage/Replacement plans. It is a good idea to check with your insurance to make sure you are covered for your visit and services with us. Please be prepared to pay your copay and any balance due at the time of your visit. We accept VISA, MASTERCARD, DISCOVER, AMERICAN EXPRESS, and CHECKS. We realize that insurance may not always cover care at Johns Hopkins. With the exception of Medicare Advantage and Medicaid plans, patients may have the ability to pay out-of-pocket for non-covered services. Patients scheduled for new patient appointments are required to pay a $600 deposit at the time of service. Patients scheduled for return visits are required to pay a $289 deposit at the time of service. In order for our office to provide you with timely refills, please request your medication refills at least one week in advance. Refill requests may be made via a myChart message to your provider, calling our office, or by receiving a fax from your pharmacy. The only documentation regarding your health or illness required by law (and included in the office visit charge) is an office visit note. Completing paperwork for schools, camps, Family Medical Leave Act (FMLA) claims, long-term care, life insurance, the Department of Veterans’ Affairs, and other disability claims go beyond routine medical care and may require an update of your medical information or a special examination. In order to make this determination, please forward your form(s) to our office prior to your scheduled visit. For those forms that can be completed outside of a clinical visit, please allow a minimum of 5 business days for your completed form to be returned to you.